In planning for a sustainable future for our planet, it is vital that we achieve a seamless and benign biointegration of all human interventions in the natural environment. Finding green design solutions for our built environment must start from the wider scale of regional and urban planning and must then be carried right through to infrastructural engineering, architecture and industrial design. Masterplanning affords the chance to redress current environmental imbalances and to reduce the consequences of our built systems on the environment, with the greater and of reversing climate change. Ecomasterplanning presents a groundbreaking integrative and comprehensive approach to masterplanning, illustrated by examples that Ken Yeang – the original pioneer of the ‘green skyscraper’ – has designed in a highly visually driven format, the book examines over 20 of his masterplans from around the world, including those in the Netherlands, china, India, Turkey, Malaysia, Singapore and North America. 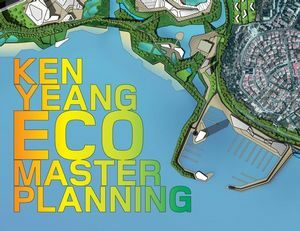 Ken Yeang is an architect-planner, and one of the foremost ecodesigners, theoreticians and thinkers in the field of green design. Yeang is the author of several books on ecological design, including The Skyscraper, Bioclimatically Considered: A Design Primer (1996) and Ecodesign: A Manual for Ecological Design (2006), both published by Wiley-Academy. A principal of Llewelyn Davies Yeang (UK) and its sister firm, Hamzah & Yeang (Malaysia), Yeang is well known for designing deep green masterplans and high-performance buildings that go beyond the usual platinum green ratings, made unique by his signature and developing ecological aesthetic. He received his doctorate from Cambridge University, and is the distinguished Plym Professor at the University of Illinois (Champaign, Urbana) and Adjunct Professor at the Universities of Malaya, Hawaii (at Manoa) and Tongji (Shanghai). He is an Honorary FAIA and has served on the RIBA Council. 1 Foreword by Steve Featherstone. 2 Introduction: Ecomasterplanning and Ecocities. 3 SOMA, Rajarajesjawri Nagar, Bangalore, India. 4 Macau Waterfront, Macau, China. 5 West Kowloon Waterfront, West Kowloon, Hong Kong, China. 6 Huanan New City, Guangzhou, China. 7 University of Amsterdam, Amsterdam, The Netherlands. 8 Rotterdam Waterfront Ecocity, Rotterdam, The Netherlands. 9 Business Advancement Technology Centre, Düsseldorf, Germany. 10 Beijing World Science and Trade Centre, Chaoyang District, Beijing, China. 11 Green Square Town Centre, Sydney, Australia. 12 Paramatta Road, Sydney, Australia. 13 Fo Guang Shan Buddhist Monastery, Kota Kinabalu, Malaysia. 14 Al-Shamiyah, Mekkah, Saudi Arabia. 15 University of Nottingham Malaysia Campus, Semenyih, Selangor, Malaysia. 16 Jabal Omar Towers, Mekkah, Saudi Arabia. 17 Al Ghorfa, Kuwait City, Kuwait. 18 Vancouver Waterfront, Vancouver, British Columbia, Canada. 19 Premier City, Almaty, Kazakhstan. 20 Dubai Waterfront, Jebel Ali, Dubai, United Arab Emirates. 21 Brunsfield, Kuala Lumpur. Malaysia. 22 Sydney Waterfront, Sydney Australia. 23 Conclusion: The Ecomasterplanning Imperative by Robert Powell.